Got a fallen tree or someone felled it for you? 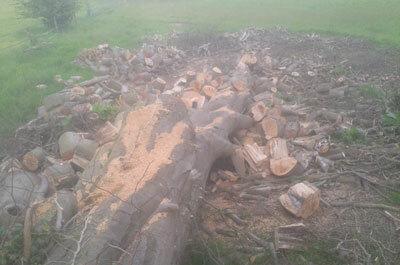 If you have a fallen tree lying on your property, or the tree surgeons cut down and made safe. We don’t cut trees down but we do cut them up and split them into manageable sizes. We give you the complete service from a tree lying on the ground to a big pile of split logs ready for off site removal or dry out for your fire. The time it takes to do this will depend on both the tree(s) and access. An estimate of time and cost is free. So why not use the contact form and get in touch today.